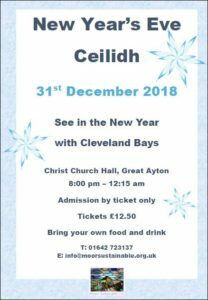 We hope you will be able to join us in dancing the evening away, with the Cleveland Bays Folk Band and caller Ian Appleyard, until midnight strikes and then see the New Year in together. Many of you will know the band from the ceilidhs they run during the year in this area. Come by yourself or with friends, bringing your own food and drink. We’ll be there to welcome you and show you to your reserved seat(s). Tickets, priced £12.50, are available from Thursday 1st November. To enquire about buying tickets, phone 01642 723137 or email.